Chronic back pain recommends you do all in your power to prevent it. Chronic back pain recommends you do everything in your power to prevent it. Do everything in your power not to allow any condition to become chronic, and especially lower back pain. Often difficult decisions have to be made; like taking a few weeks off work so you don't need to sit. If it's already chronic, the die is cast and there's no virtue in castigating yourself or your doctors. It's why, after a month or so, I recommend a good hard look at your progress. Is it time for a change of doctor? From your medical man to a chiropractor? From your DC to a PT? Or simply to a different person using perhaps activator methods, rather than conventional manipulation, for example? 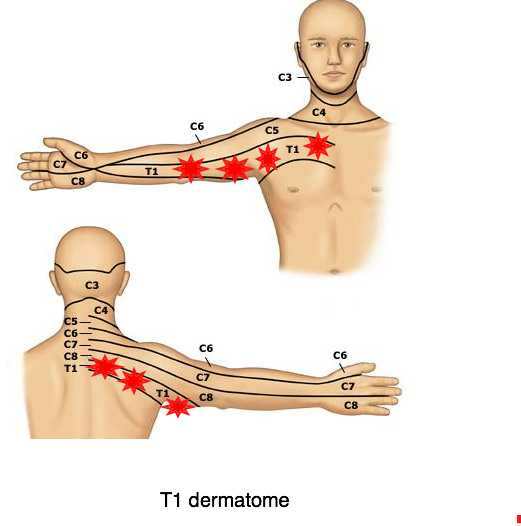 Worse, neglected or mismanaged spinal conditions usually begin with back or neck pain, but very frequently progress to far worse pain radiating down the arm or leg. And sometimes weakness in the limb too. The nerves involved in lower lumbar back pain radiate from the bottom of the spine, through the pelvis and emerge from the buttock, before going down the leg to the toes; it's known as sciatica and a common symptom of chronic back pain; do your utmost to avoid it. Those from the mid to upper lumbar spine pass through the groin to the front of the thigh. 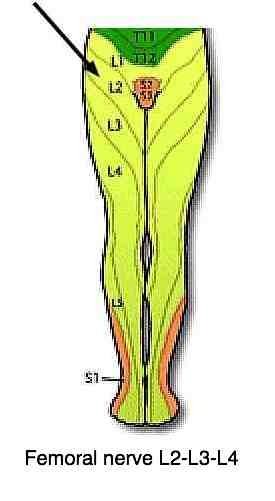 Considerable variation exists between people.The pain is often severe at night, unable to sleep due to a deep ache in the side or front of the thigh, extending down to the knee? 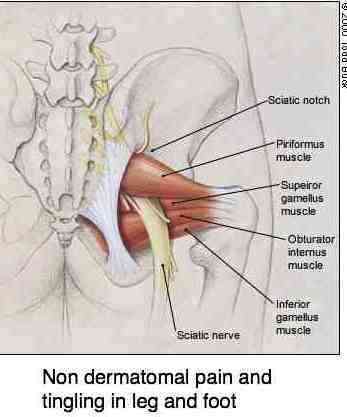 As the sciatic nerve emerges from the buttock, between two muscles, it may be further irritated by the Piriformis muscle if there is also a sacral subluxation (the origin of the Piriformis is the sacrum). The piriformis passes from the sacrum so the hip bone. All in all, avoid developing chronic back pain if you possibly can. Find treatment that works for you, slow down long enough for it to get properly better and generally it's best to follow your doctor's advice. Avoid chronic medication and do some lower back exercises every morning before getting out of bed. Chronic back pain strongly recommends you do whatever it takes to get properly better or you'll start to suffer from even worse tingling and burning in your leg. Sometimes massaging bed rest may be necessary, especially if you are in severe pain, or you know it's not getting better. For non-severe lower back pain, bed rest will often aggravate the condition, but sometimes, for example if you are standing in an "antalgic posture" then modified bed rest is mandatory. Read more about what "modified" means at that massaging bed rest link. The alternative is often chronic back pain and perhaps leg pain. The temporary functional scoliosis known as an antalgic posture is a very serious sign; if not taken seriously it leads inevitably to chronic back pain and a painful sciatica. The central part of the disc, known as the nucleus pulposis has become displaced causing this very discomforting stance; I call it the Pisa sign. The first rule with an antalgic posture is that you can't and shouldn't stand for long; that means some time lying down, because sitting is forbidden. More on that pain in the groin and side or front of the leg. The Femoral nerve descends downwards in front of the spine, piercing the Psoas muscle and then, instead of passing backwards through the sciatic notch, continues down through the groin to the front of the leg. It too is the symptom of a neglected chronic back pain injury, especially in the older person. 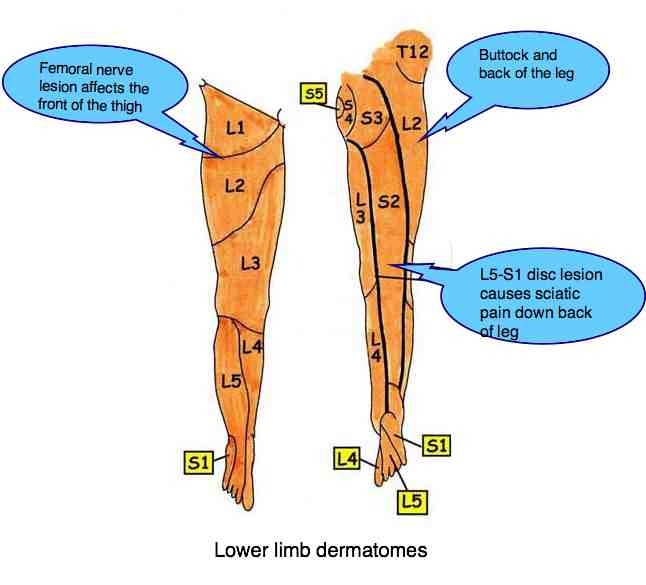 A lesion in the mid lumbar spine causes a deep severe ache in the thigh, often worse at night. No, it's not hip arthritis, a Femoral nerve lesion that untreated will cause severe chronic back pain, leg pain, weakness of the thigh muscle, the Quadriceps muscle, and numbness in the leg. My own personal femoral nerve damage was a nightmare and it wasn't for excellent chiropractic care would certainly have led to surgery and chronic back pain. This condition occurs typically in the older patient. Groin and thigh pain. This is definitely a situation to avoid. 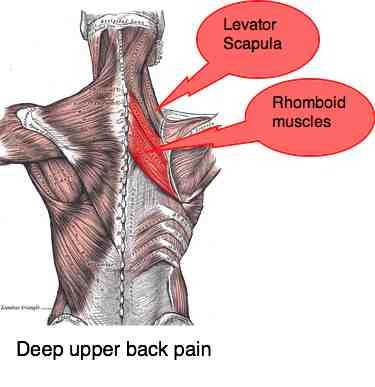 Unrelenting back and neck pain so often begin radiating down the limb. Then the surgeon starts to get all excited... rather FIRST get your chiropractor all excited BEFORE it feels like sweat, pain and tingling running down your arm. Sometimes, particularly if you have no insurance, you may be tempted to forego the latter part of care when you know it's getting better. My strong recommendation is to get properly better, otherwise the specter of chronic back pain is likely to hang over you; I see it all the time in the practice. It's not wise. Firstly 50 percent less pain is the dangerous time. The pain goes away faster than it heals. Set backs are common at this stage. Then some rehab exercises are a vital part of chiropractic help to avoid chronicity. 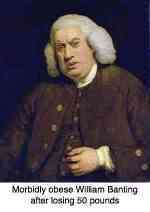 Curtail the treatment at your peril! If the Slump test for sciatica produces significant pain in the leg, then it's advised that you don't sit for at least a few days, and sometimes weeks. If you don't, difficult though it may be, then the chances of your back pain becoming chronic are significantly increased. Conversely, you don't want to stay at home for too long; then the chances increase that you will never return to work. One frightening piece of research shows that if you have neck pain for six months, you'll have it for the rest of your life! No matter what treatment you have. Scary! Don't let it happen to you. Modic changes in the spine are strongly associated with chronic back pain. 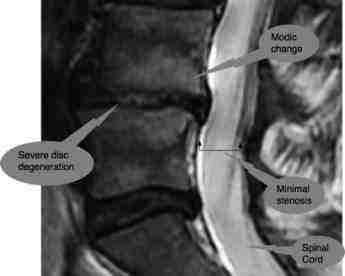 Swelling into the bone from an adjacent degenerate disc, known as a Modic Effect, or Modic Change, has now been strongly associated with an infection. And with chronic low back pain. Nearly a half of people suffering from chronic low back pain have Modic changes in the low back. To put it differently, it is now suspected that many of those suffering from chronic lower back pain may in fact have a bone infection. And whilst this has not yet been proved, may respond to a course of antibiotics. Scientists from the University of Southern Denmark investigated the disc material from 61 patients who underwent spinal surgery. 43 percent of the patients were found to have an anaerobic bacterial infection; bugs that can live in the absence of oxygen. After surgery, 80 percent of the patients who were found to have the anaerobic infection developed new modic changes. Compared with that, 44% of those who had no infection developed such an effect. There's another even more discouraging slant; after spinal surgery patients are highly likely to develop modic changes, and hence chronic back pain. Watch this space: antibioltics may in the future may be an important part of the management of chronic back pain. But first, hard scientific evidence is needed that they are part and parcel of the management of chronic lower back pain. Vegetarians generally are healthier than meat eaters, but there are dangers if you later in life decide to drop all animal products from your diet; born into a family of vegans you will learn how to prevent deficiencies. Simply dropping all animal products from the diet, without compensation, almost certainly for example will lead to vitamin D and B12 deficiencies; these are absolutely essential in the diet to prevent osteoporosis and anaemia. Tired all the time syndrome is a likely consequence. So is chronic back pain, and hip pain. They're a fun, light read. Seven years of chiropractic practice in Holland. 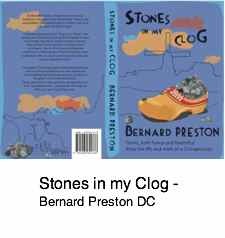 Walk with me through the polders, meet the characters, join me in my tribulations. Know what fired "op staande voet" means?